Figure 1. The Arctic fox is specially adapted to live on frozen ground. No matter where they live, animals have some basic needs. They need food and water to give them energy, they need to stay at a comfortable temperature, and they need to avoid being eaten. For animals livingon frozen ground, life has special challenges. Food is limited, water is frozen, and the weather can be extremely cold. Yet animals do live in places with frozen ground. How do animals survive frozen ground in winter? In the winter, frozen ground areas have frozen surface water and cold temperatures. Some animals migrate to places with easier living conditions. Other animals hibernate, sleeping the season away in warm burrows. Animals that stay on the surface have to adapt to the cold and icy environment. 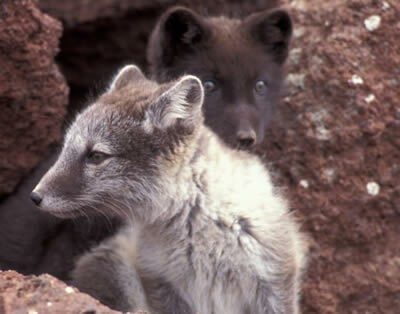 For example, one animal that lives comfortably in areas with frozen ground is the Arctic fox (Figure 1). 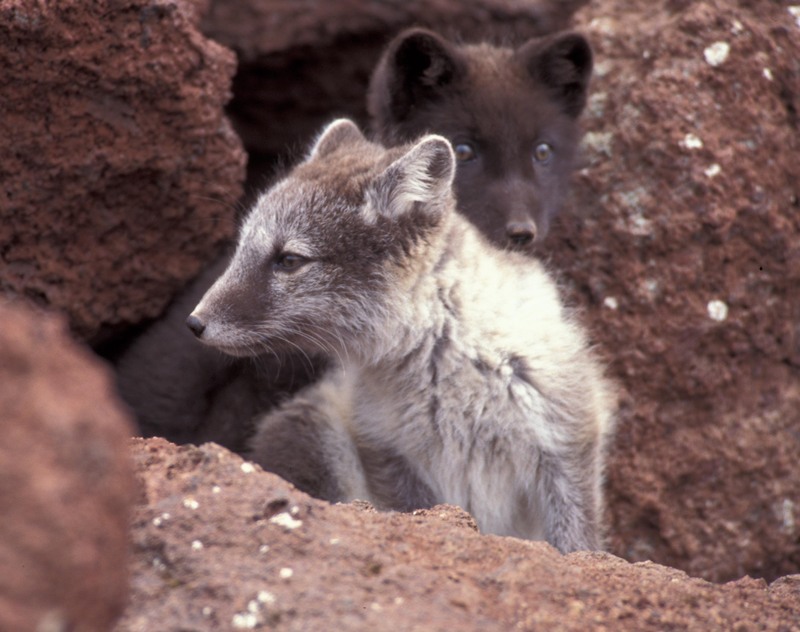 Like squirrels, the Arctic fox stores food such as bird eggs in the permafrost during summer. The eggs remain edible for up to a year. During the winter the fox always has something to eat, even when the fox's favorite food, the collard lemming, is not available. The Arctic hare has also adapted to survive on frozen ground. Unlike most rabbits, the Arctic hare does not build burrows underground because it is too difficult to dig when the ground is frozen. Instead, Arctic hares build grass nests high up among rocks. The raised nests give them shelter and also offer a place to spy on predators. The Arctic hare can eat snow when it is thirsty. Figure 2. Caribou migrate to spend each season in the best environment. 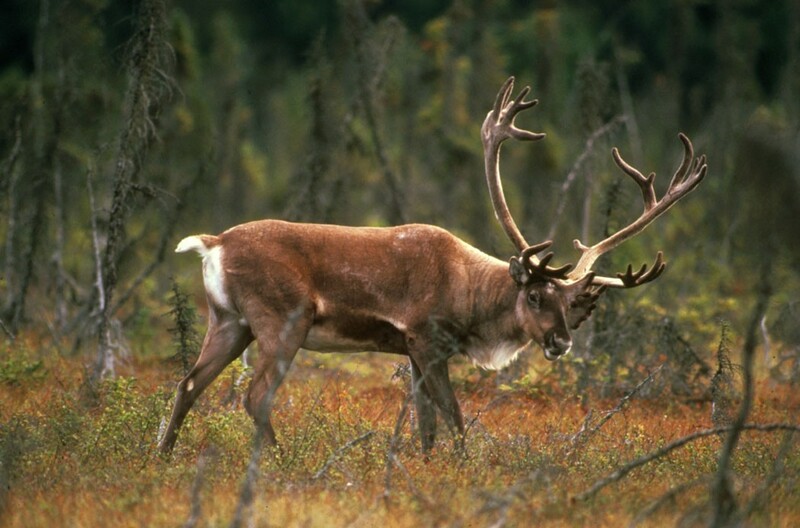 In the summer, caribou find food and safe places to have their young in the bogs of permafrost areas. Figure 3. 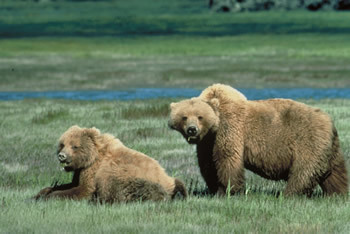 Grizzly bears often live in areas with permafrost and frozen ground. Is frozen ground always a hard place to live? In summer, places that have permafrost offer some nice benefits. Water from melted snow and rainfall cannot seep through the underlying layer of frozen ground. Water collects on the surface, forming bogs, marshes, and wetlands that are the animals' water source. These areas are perfect for many animals to breed. In the summer, animals find food easily because water and long hours of daylight help plants grow quickly. 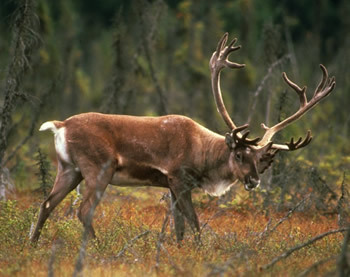 One example of an animal that enjoys spending the summer in areas with permafrost is the caribou (Figure 2). The caribou is related to deer and other hoofed animals. Caribou travel hundreds of miles so they can enjoy the grasses and other foods found in the bogs and marshes. Plus, the open lands do not have many trees. Caribou raise their calves safely, away from the predators that need cover to hunt. Predators can still hunt the caribou, but they are less successful than if they had places to hide and stalk the caribou. Summer's warmth and water also helps insects. Flies, mosquitoes, deer flies, and tiny biting midges breed in the marshy swamps above the permafrost. Insects are an important food for birds, but insects can also make life uncomfortable for animals and humans. Insects bite animals, even laying eggs on the backs of caribou. Swarms of mosquitoes can kill caribou calves and even adult caribou. Caribou are said to be always roaming, trying to escape the mosquitoes. Brown bears, which include the famous and fearsome grizzly bear (Figure 3), are some of the Arctic's best-known large mammals. Brown bears eat a huge amount of food in the summer and fall to prepare for winter. During the winter they often sleep for months at a time. This helps them conserve energy during the long winters, when food may be hard to find. Brown bears do not necessarily hibernate the way some bears do.